Hey guys, this is the offical replacement for the old EnemyBuffTimersVanilla UnitFrames Fork! The new addon is based on aurae by Bit aka shirsig! - no more fixed timers! Last edited by Renew on Sat Dec 17, 2016 11:22 am, edited 2 times in total. I get the following error the first time I cast a spell with a debuff on a target (lock, priest & druid). After that initial error, each and every spell I cast, even un-targeted ones like life tap, will also generate the error. I tried using it on a new copy-install with no WTF or WDB folders and no other UI mods installed and I still get the same problem. The old version of aurae works fine for me too, so it's not that. This error does not trigger on insect swarm (presumably because it's not in the debuffs.lua), although I don't get a debuff timer either of course! Okay, so I went back to your initial commit from this morning (Init Renew Mod) and that worked like a beauty (thank you so much for doing this, btw!). After playing around with this for a while, I must say that this is just tremendous, bigly even. 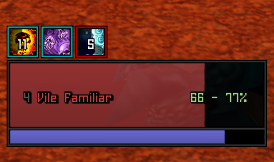 A truly unprecedented advancement in the vital field of vanilla wow private server debuff timer tracking on unit frames. You can do-canceling diminishing returns, and filter to display only stuns? I need this addon instead Stunwatch. And still a good idea to make changes not only the scale but also the length of the bars. Thank you. surpr wrote: You can do-canceling diminishing returns, and filter to display only stuns? I need this addon instead Stunwatch. And still a good idea to make changes not only the scale but also the length of the bars. Thank you. Ravni wrote: Okay, so I went back to your initial commit from this morning (Init Renew Mod) and that worked like a beauty (thank you so much for doing this, btw!). - added an option to change the textsize of the timer! check out /DebuffTimers ! pls update your version and delete the old one!